The year 2012 will have marked businesses by the complexity of a fluctuating market and by the acceleration of the production cycles. The complexity has not always consisted of gaining market share but, most frequently, of anticipating changes, maintaining margins or countering risks in the face of ever more threatening competitors. 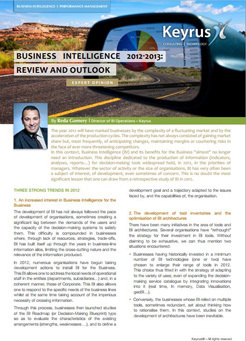 In this context, Business Intelligence (BI) and its benefits for the Business "almost" no longer need an introduction. This discipline dedicated to the production of information (indicators, analyses, reports…) for decision-making took widespread hold, in 2012, in the priorities of managers. Whatever the sector of activity or the size of organisations, BI has very often been a subject of interest, of development, even sometimes of concern. This is no doubt the most significant lesson that one can draw from a retrospective study of BI in 2012. The development of BI has not always followed the pace of development of organisations, sometimes creating a significant lag between the demands of the users and the capacity of the decision-making systems to satisfy them. This difficulty is compounded in businesses where, through lack of resources, strategies, trade-offs, BI has built itself up through the years in business-line information silos, limiting the cross-cutting nature and the relevance of the information produced. In 2012, numerous organisations have begun taking development actions to install BI for the Business. This BI allows one to address the local needs of operational staff in the entities (departments, subsidiaries…) and, in a coherent manner, those of Corporate. This BI also allows one to respond to the specific needs of the business lines whilst at the same time taking account of the imperious necessity of crossing information. Through this process, businesses then launched studies of the BI Roadmap (or Decision-Making Blueprint) type so as to evaluate the characteristics of the existing arrangements (strengths, weaknesses …), and to define a development goal and a trajectory adapted to the issues faced by, and the capabilities of, the organisation. Businesses having historically invested in a minimum number of BI technologies (one or two) have chosen to enlarge their range of tools in 2012. This choice thus fitted in with the strategy of adapting to the variety of uses, even of expanding the decision-making service catalogue by integrating innovations into it (real time, In memory, Data Visualisation, geoBI…). Conversely, the businesses whose BI relied on multiple tools, sometimes redundant, set about thinking how to rationalise them. In this context, studies on the development of architectures have been inevitable. Even if businesses agree that it is beneficial and essential to use BI, certain managers have encountered three major concerns : the costs generated by BI, its capacity to meet the needs of users and its governance. In the field of BI, experiences have been varied and certain businesses have genuinely suffered from costly BI which has been complex to master and has sometimes generated numerous internal tensions (IT, Business-line). The practice of putting in place BI Competency Centres (BICC) developed in 2012 and confirms the tendancy of organisations to seek a solution to these issues of concern. For all that, BI remains a discipline which is complex to orchestrate and particularly so in large organisations : Who is to govern it ? How must one govern it ? How must it fit together and interact with the other entities ? These are many questions which certain businesses asked themselves in 2012 and which are still relevant. BI is becoming more and more analytical by opening itself up more to users and by moving towards more forecasting, anticipating and detecting of new correlations between the data (structured or non-structured). This use should intensify within businesses, supported by an organisational trend which is tending to reinforce and formalise the role of Business Analyst. In line with this approach, the deployment of Data Visualisation tools should accelerate. The subject of Big Data, still sketchy for certain businesses, has given rise to a deluge of press releases and opinions in 2012. For all that (or as a result of that), the subject has a hard time managing to be addressed in a systematic and concrete way within French organisations. Amongst the obstacles to Big Data initiatives and solutions being put in place, we note the difficulty that certain businesses have finding cases for functional use which generate high overall added value. The subject requires greater awareness and extensive involvement, on the part of the business lines, in identifying these cases for use linked to the variety, the volume and the velocity of the data exploited. In other words, the coupling of BI & Big Data should be a real generator of value. The businesses which will have assimilated this equation at the level of their activity, will invest themselves more in implementing Big Data initiatives. In 2013, Cloud Computing should gradually take its place on the French BI market. The concerns linked to data security are being increasingly alleviated by tested solutions offering flexibility, scalability (extensibility) and competitiveness. Beyond these benefits, certain uses of BI lend themselves to modes of consumption in the form of services (departmental uses, needs from time to time …). The BI Cloud should eventually constitute a relevant economic scenario, even an indispensable solution for structuring the environments of costly BI projects. In a general manner, the trend towards BI Cloud will also develop on the side of the BI publishers' market, in their development roadmap. In numerous organisations, BI goes hand in hand with data management. BI projects have often highlighted the need to manage data more effectively, in particular reference data (MDM). BI also reveals the importance of the quality of the data managed, produced and disseminated. The coupling of BI and of Data Management is not a new trend for businesses. This approach should continue in organisations, with the available tools, the processes and data governance being reinforced. For certain organisations, this sometimes resembles an oxymoron. All users agree on the necessity of having agile BI and certain businesses have already got started on methodological principles, processes and tools allowing this requirement to be met. Nobody doubts that this trend will grow in 2013. Obviously, when one evokes agility, that concerns the processes for dealing with user needs, generating information from source data, making BI developments available or even undertaking projects. In its momentum for development BI is going through change within organisations. Its development trends and the level of activity in the market for it sum up its potential to open itself up to all and gain in importance. Nobody doubts that BI will continue to impose itself in 2013 as the essential discipline for offering the decision-maker that precious vision of the reality of his Business. Reda Gomery is Director of Operations in charge of BI activities at Keyrus. An expert in Business Intelligence, he has been involved for more than fifteen years in advising and assisting numerous organisations in relation to the transformation of their decision-making systems. The author of several articles and works, Reda Gomery regularly works with managers or management committees to enhance their awareness of the stakes involved with the decision-making systems of a Business and of the development trends in this market.